Pontiac Solstice Forum > Technical Solstice Discussion > Mods - Engine 2.0 Turbo > Ringing sound from turbo? So I completed the install of the WR3 (EFR6758) turbo upgrade last night along with a catted downpipe, external wastegate and DDM intake and charge pipes. I was idling the car and everything sounded fine. I then held the rpm around 1500 while making sure my temps weren't climbing when I heard a high pitched ringing sound. It sounded like something spinning fast and nicking a piece of metal causing it to ring. The end result was almost a continuous tone similar to a tuning fork. When I let off the gas it went away. If I held it again between 1500-2000 it would start again after a few seconds. I repeated this three times then turned off the car. Tonight I warmed the car up with the intent of recording the noise except that I couldn't reproduce the sound. All of my attempts holding the idle between 1500-2000 failed. I listened to the various sections of the turbo with a dowel and everything sounded fine. I'm not sure what to think at this point. I've sent the question off to [email protected] In the meantime I thought I'd post here in case someone has ever experienced anything like this. I did a search on Google and there are a surprising number of people who have asked about the same thing on various cars but I never found anyone that seemed to conclusively find the source. I'd check the shaft play and look for any markings in the housing from the wheel. So my high frequency ringing seems to have turned into a lower frequency rattle. Sometimes it's there and sometimes not. I drove the car lightly around the block and heard it letting off the throttle. Seems to be associated with the bypass valve operation. Still not sure what's causing it. The rattle was back in force tonight. It's only at low RPM so far. I can't find anything loose. Thoughts? I had a similar rattle. There is what I call a mesh hinge that allows the exhaust to move in 2 different pieces. It should be within the area of the passenger door, underneath the car. These rings on mesh hinges that hold the mesh to the pipes tend (especially if you have a Solo exhaut) to come loose. Check that part first!!!! It honestly sounds like you have something loose on your exhaust/turbo somewhere. One of the reasons I asked what year your car, is that it could be your timing chain... But I would guess it's more something loose. Last edited by The_Ghost; 03-16-2019 at 12:54 PM. I think you nailed it Ghost. I was checking the exhaust from the cat connection forward as that was where all of the work was done but it appears to be coming from the exhaust pipe somewhere rear of there. 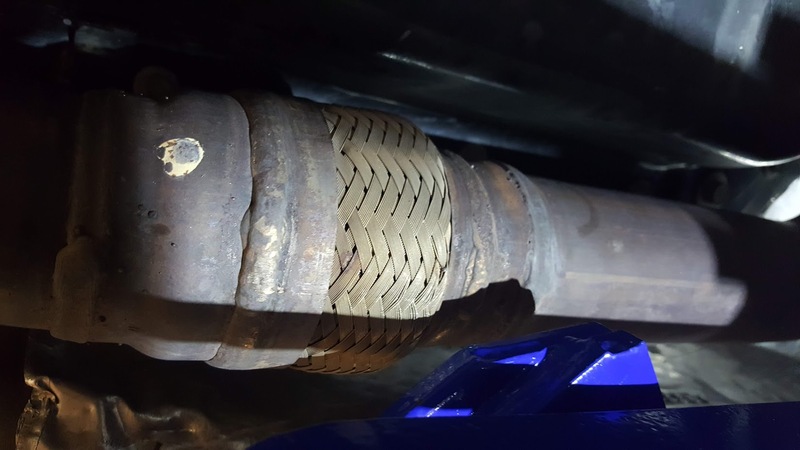 I don't see anything loose/damaged and the pipe is not making contact with anything external other than the downpipe connection and suspension hangers on the muffler. I did push the whole pipe to the side about 8 inches when swapping out the cats so I guess I must have broken something in there somewhere. I can't see anything loose around the mesh connection and the sound does seem to be further back but it's hard to tell for sure. had a problem like this with oem setup was a loose bolt near the block infront of the cat that holds a support for the oem turbo... somehow it rattled lose or was never tqed down form previous owner. only did it between 800-1300 rpm.